It has been a while since I have done a Would You Buy It Wednesday, simply because there are no garage or auction sales to go to, and I have found very little at the thrift stores. However, I had to show you this little guy. He is a teddy bear that is about 14″ tall. He has a tag on it that says Animal Fair Inc. 1976 Eden Valley, MN. He was only $.99 when he was originally marked at $5.99 so I had to take a chance. 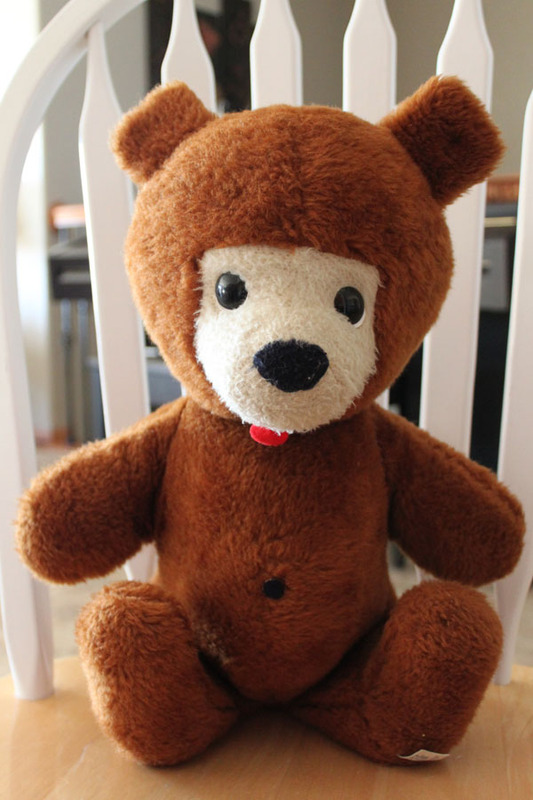 I am not into stuffed animals and have never bought a vintage before. I have no idea if something like him sells or not, but I will try to research him and see what I find. I will list him once I find out more information and see what happens. So do you ever buy stuffed animals? Do they resell? I have an Animal Fair Inc. from Eden Valley, MN large gray stuffed teddy bear from the 80’s. Sometimes I like to look for things similar to those from my childhood, so yes I see them sell often. Abby, glad to hear that these sell. I have had mine listed for a while now and it hasn’t sold. I have grown fond of him and will probably keep him if he doesn’t sell. Glad others enjoy these stuffed animals from the 80s.